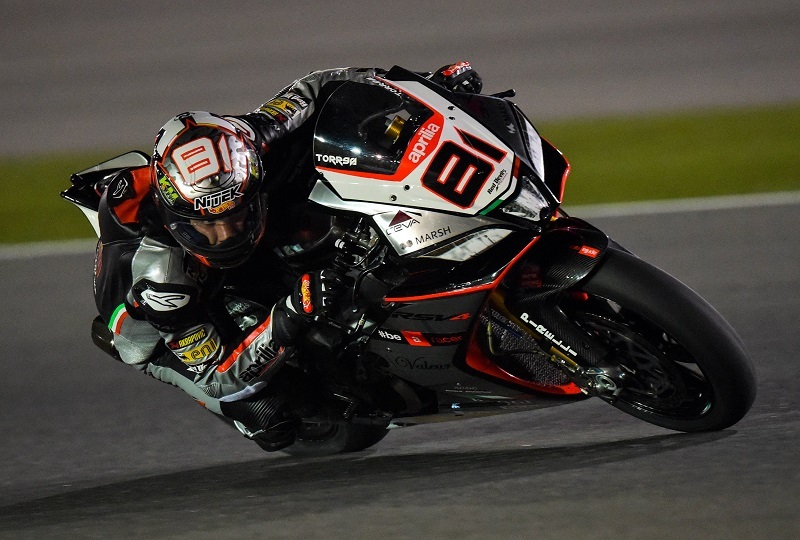 Doha (Qatar), 16 October 2015 – The artificial lighting at the Losail International Circuit illuminated a great performance by Jordi Torres, fast straight away on his RSV4 RF in the two practice sessions today, the prelude to the WSBK races on Sunday. The Spanish rookie dominated FP1, placing more than half a second between himself and his closest rival. In the second session Jordi worked on tyre duration and the search for a better feeling, especially on a couple sections of the track where he feels that he can improve further. The stopwatch confirmed the good sensations that the Aprilia Racing Team – Red Devils rider has, second in the combined standings and very effective in terms of race pace. A less than perfect start in FP1 conditioned Leon Haslam’s first day. In the second session, on the other hand, the rider from Derby improved consistently, shaving more than a second off his time by the end of the day. His sixth place in the combined standings, together with the wide margin of potential for improvement, makes Leon optimistic for the practice and Superpole sessions tomorrow.